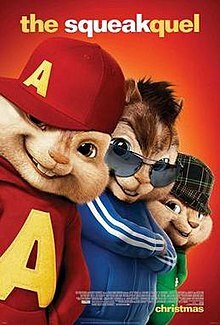 Alvin and the Chipmunks: The Squeakquel is a 2009 American live-action/computer animated musical family comedy film directed by Betty Thomas. It is the second live action/animated film starring Alvin and the Chipmunks and stars Justin Long, Matthew Gray Gubler, Jesse McCartney, Christina Applegate, Anna Faris, Amy Poehler, David Cross, Zachary Levi, and Jason Lee. The film was written by Jon Vitti, Jonathan Aibel and Glenn Berger, distributed by 20th Century Fox, and produced by Fox 2000 Pictures, Regency Enterprises and Bagdasarian Company. It is a sequel to the 2007 film Alvin and the Chipmunks and was released in theaters on December 23, 2009 by 20th Century Fox. The film grossed $443.1 million on a $70 million budget. During a benefit concert in Paris, France, David Seville is seriously injured from a backstage accident, when a cardboard cutout of Alvin sends him flying across the stage. Having to recuperate there, Dave asks his aunt, Jackie, to look after the Chipmunks, Alvin, Simon, and Theodore. Arrangements are also made for them to go to public school at West Eastman High School. After Jackie also has an accident, the Chipmunks are left in the care of Toby, Jackie's grandson. Meanwhile, Ian Hawke, who is broke and destitute, lives in the basement of JETT Records. Three singing female chipmunks, Brittany, Jeanette, and Eleanor, also known as The Chipettes, emerge from a FedEx package. Ian recruits and hires the Chipettes in an effort to resurrect his career. While at school, the Chipmunks are ridiculed by jocks, who threaten to kill them for drawing their girls' attention away from them. They chase the Chipmunks around the school and give Simon a swirlie in a toilet. They visit the principal's office, only to discover that the principal, Dr. Rubin, is a huge fan, and she enlists their help to raise money for a music program by participating in a contest. Meanwhile, Ian is shocked to find the Chipmunks on the front page of his newspaper. After he reads a story about them, he quickly sends the Chipettes to school. When the Chipmunks meet the Chipettes, both groups are smitten with each other. However, Brittany reminds the girls that Ian said the Chipmunks betrayed him and that they can’t be trusted. Meanwhile, Alvin and the boys struggle to make it through a rehearsal because of their new crushes. Suddenly, Ian smugly walks in and introduces his new stars, the Chipettes. The boys are shocked to see the girls are working with Ian and a rivalry quickly emerges when Ian convinces Dr. Rubin to let the Chipettes compete in the Battle of the Bands. With both groups wanting to compete in the Battle of the Bands, Dr. Rubin sets up a concert for them to compete in with the winners representing the school. Meanwhile, Alvin becomes popular with the jocks and joins the football team, not realizing that the next game is during the concert. At the concert, Theodore and Simon tell the fans that Alvin failed to show up, and that they cannot perform, leading to a victory for the Chipettes. When Alvin finally shows up after the concert is over, he finds the auditorium empty, and Brittany calls him out for his lack of responsibility. Alvin then returns home and attempts to apologize to his brothers, but is ignored. Theodore runs away the next day, until Alvin and Simon save him from an eagle, leading to the three making up. Soon, the Chipettes are hired, but learn that the concert at which they are to perform as an opening act for a Britney Spears concert at the Staples Center is on the same night as the school contest. Ian convinces them to call off the battle and perform at the concert, but refuses to give the same credit to Jeanette and Eleanor that he gives Brittany. She demands that they all perform together or not at all, until Ian threatens to send them to a barbecue restaurant unless they perform. Before the Battle of the Bands, Alvin receives a call from the Chipettes, who tell him that Ian has locked them in a cage, so Alvin races off to rescue them while Simon tells Jeanette how to pick the lock over the cell phone. Simon and Theodore are on the verge of going out to perform until the others arrive just in time to perform at the contest. The Chipmunks and the Chipettes perform together and receive the money for the music program. Dave, who had left the hospital upon learning that Toby was looking after the Chipmunks, returns during the contest, happy to see the Chipmunks again. Meanwhile, Ian is further exposed at the concert of Staples Center he set up for the girls when he attempts to imitate them, only for him to be taken away by security guards. After the contest, Dave allows the Chipettes to stay with them. In the next scene, both the Chipmunks and Chippettes are getting ready for bed. Alvin says he's not tired, but Dave says Alvin has school. They fight with the light switch, until Dave trips over Alvin's skateboard. In the mid-credits scene, Dr. Rubin has the jocks scrape the gum off from under the bleachers in the gymnasium as punishment for making Alvin late for the sing-off. In the post-credits scene, Ian is thrown into a dumpster. The review aggregator Rotten Tomatoes reports that 20% of 83 critics have given the film a positive review, with a rating average of 3.9/10. The site's general consensus is that, "This Squeakquel may entertain the kiddies, but it's low on energy and heavily reliant on slapstick humor." On Metacritic, which assigns a normalized rating out of 100 to reviews from film critics, has a rating score of 41 based on 20 reviews, indicating "mixed or average reviews". Owen Gleiberman of Entertainment Weekly graded the film a C-. Gleiberman wrote in his review with this question: "Will kids eat up this cutely fractious claptrap? Of course they will. They'll eat up whatever you put in front of them. But that doesn't make The Squeakquel good for them." Sue Robinson from Radio Times said that "even if there's little here for older viewers to enjoy, youngsters will love the slapstick action and catchy soundtrack." Some reviews were positive, such as Joe Leydon, writing for Variety, calling it "a frenetic but undeniably funny follow-up that offers twice the number of singing-and-dancing rodents in another seamless blend of CGI and live-action elements." Betsy Sharkey of the Los Angeles Times commented on Betty Thomas' direction, saying that she brings "a light campy touch as she did in 1995's The Brady Bunch Movie." After the film had garnered $112 million worldwide at the box office over its first weekend, some critics were disappointed that it was more popular than other movies in wide release aimed at a family audience. Richard Corliss of Time wrote that families "could have taken the cherubs to The Princess and the Frog or Disney's A Christmas Carol, worthy efforts that, together, took in only about a fifth of the Chipmunks' revenue in the same period". On its opening Wednesday, the film opened to #1 with $18,801,277, and finished the weekend at #3 behind Fox's own Avatar and Warner Bros' Sherlock Holmes with $48,875,415 and a $75,589,048 5-day total, eclipsing its budget in only five days. Domestically, it is the 9th highest-grossing film of 2009, and on March 7, 2010, it outgrossed its predecessor to become the second highest-grossing film to never hit #1 behind My Big Fat Greek Wedding. Alvin and the Chipmunks: The Squeakquel ended its run with $219,614,612 domestically and $223,525,393 overseas with a total of $443,140,005 worldwide, which is higher than its predecessor. Alvin and the Chipmunks: The Squeakquel: Original Motion Picture Soundtrack is the soundtrack based on the film. It was released on December 1, 2009. Bands Honor Society and Queensberry, along with Filipino singer Charice, were all featured artists for both the movie and soundtrack. Alvin and the Chipmunks: The Squeakquel is a platform game based on the movie. It was released on December 1, 2009 (the same day as the movie's soundtrack) only for the Wii and Nintendo DS. Alvin and the Chipmunks: The Squeakquel was released on DVD/Blu-ray/Digital Copy on March 30, 2010 in North America, on April 12, 2010 in the United Kingdom and on June 2, 2010 in Australia. Shortly after the film's release on DVD and Blu-ray, Fox and Regency had announced that Alvin and the Chipmunks 3D was scheduled to be released on December 16, 2011. The title was then changed to Alvin and the Chipmunks: Chipwrecked. On January 22, 2011, Fox 2000 Pictures started production on the film during a Caribbean cruise on the Carnival Dream ship. Filming took place primarily on the ship's upper, open decks with scenes featuring actor Jason Lee (reprising his role as David Seville) and the antics of The Chipmunks in the Carnival Dream's outdoor recreation areas. Stops on the itinerary included Cozumel, Roatan, Belize and Costa Maya (which provided tropical backdrops for many of the movie's shipboard scenes). A fourth film, Alvin and the Chipmunks: The Road Chip, was released on December 18, 2015. ^ a b Fritz, Ben (2009-12-28). "Holiday box-office take is highest in recent history". Los Angeles Times. Archived from the original on 1 January 2010. Retrieved 2010-01-03. ^ a b c "Alvin and the Chipmunks: The Squeakquel Box Office". Box Office Mojo. Internet Movie Database. Archived from the original on 5 June 2010. Retrieved 2010-06-01. ^ "Alvin and the Chipmunks: The Squeakquel (2009)". Rotten Tomatoes. Fandango. Retrieved September 26, 2018. ^ "Alvin and the Chipmunks: The Squeakquel (Cream of the Crop)". Rotten Tomatoes. Fandango. Retrieved 2009-12-25. ^ "Alvin and the Chipmunks: The Squeakquel". Metacritic. Archived from the original on 21 December 2009. Retrieved 2010-01-05. ^ a b Gleiberman, Owen (2009-12-24). "Alvin and the Chipmunks: The Squeakquel Movie Review". Entertainment Weekly. Archived from the original on 15 January 2010. Retrieved 2009-12-24. ^ Robinson, Sue (2009-12-24). "Alvin and the Chipmunks: The Squeakquel". RadioTimes. Archived from the original on 2010-01-17. Retrieved 2009-12-24. ^ Leydon, Joe (2009-12-20). "Alvin and the Chipmunks: The Squeakquel Review". Variety. Archived from the original on 25 December 2009. Retrieved 2009-12-24. ^ Sharkey, Betsy (2009-12-23). "Bright-eyed, Bushy-tailed". Alvin and the Chipmunks: The Squeakquel movie review, Los Angeles Times. Retrieved 2011-12-13. ^ Ryan Michael Painter (2009-12-28). "Weekend Box Office Reaction". Archived from the original on 2011-07-16. ^ Scott Mendelson (2009-12-27). "HuffPost Weekend Box Office in Review: Avatar Dominates Record-Breaking Weekend". Huffington Post. Archived from the original on 30 December 2009. Retrieved 2010-01-24. ^ Corliss, Richard (2009-12-30). "Alvin 2: The Unspeakable Squeakquel". Time. Retrieved 2010-08-09. ^ "Weekend Box Office Results for December 25–27, 2009". Box Office Mojo. Archived from the original on 17 July 2010. Retrieved 2010-08-09. ^ "Top Grossing Movies That Never Hit #1 at the Box Office". Box Office Mojo. Archived from the original on 4 August 2010. Retrieved 2010-08-09. ^ "Alvin And The Chipmunks: The Squeakquel [Original Motion Picture Soundtrack] (Amazon MP3 Exclusive Version): Alvin And The Chipmunks: MP3 Downloads". Amazon.com. Retrieved 2012-04-23. ^ "iTunes - Music - Alvin and The Chipmunks: The Squeakquel (Original Motion Picture Soundtrack) [Deluxe Edition] by Various Artists". Itunes.apple.com. 2009-12-01. Retrieved 2012-04-23. ^ "The Chipmunks are Coming in 3D, Wall Street Bumped". ComingSoon.net. Archived from the original on 2012-04-15. Retrieved 2010-03-10. ^ "Alvin and the Chipmunks: Chipwrecked at Box Office Mojo". Boxofficemojo.com. 2011-12-16. Retrieved 2011-12-27. ^ "Alvin and the Chipmunks Movie Filmed on Caribbean Cruise". Travel Agent Central. 2011-02-02. Retrieved 2011-12-27.